Update Contract States job is CRM 2011 (also for CRM 4.0) system job which runs daily and change the contract status based on contract start date and end date (i.e. change contract from Invoiced to active and from Active to expired). One of customer’s CRM organization has this job running 10 PM at night and wanted to change this job on particular time (very early in the morning) to make sure contract status are up to date when users starts using CRM system. There is job editor provided by MS to reschedule CRM system jobs but this does not include this specific job. so following are steps we undertook with the help of CRM parter/MS support to reschedule this particular job in CRM system. following quick details regarding important columns in this table. RecurrencePattern is used to describe frequency and interval of the system jobs and please refer this article for more information on regarding this. RecurrenceStartTime is also UTC datetime field which will be used to set next runtime of job, date part of this field is not important as long as it is set in the past. Step 2: so using noted down AsyncOperationid in step 1 run following query to update recurrencestarttime, postponeuntil for this Update Contract States job . So as per above update, this job will run at 9:08 AM (GMT time) in the morning every day.after job run if you verify the details then it would look as follows. So as you can see system will update postponeuntil (next run time) to next day (24th October) after this job run today (on 23th October). above change is unsupported so make sure you apply this change to Dev, Test environment before applying this to Live environment. Also make sure you take back up of database before doing this change. This entry was posted in CRM 2011, CRM 4.0, SQL, Tips & Tricks and tagged contract states, contract status, CRM 2011, CRM 4.0, SQL, Tricks, Unsupported on October 23, 2012 by mayankp. Recently come across scenario where one of CRM user left the company and that user owned specific views which need to be transfer to his replacement CRM users. These views created by old user using CRM advanced find screen and hence they are personal view of that user and as per CRM security settings even system administrator can not able to view and transfer this views to new user. So I decided use impersonation to resolve this issue and created small standalone application for the same. This application is shared below. Following is few more details regarding this application for the same. Step 1: after downloading, CRM2011_ReAssignViews_EXE.zip and extract the files. Step 2: after extracting run the CRM2011_ReAssignViews_EXE.exe from extracted files. 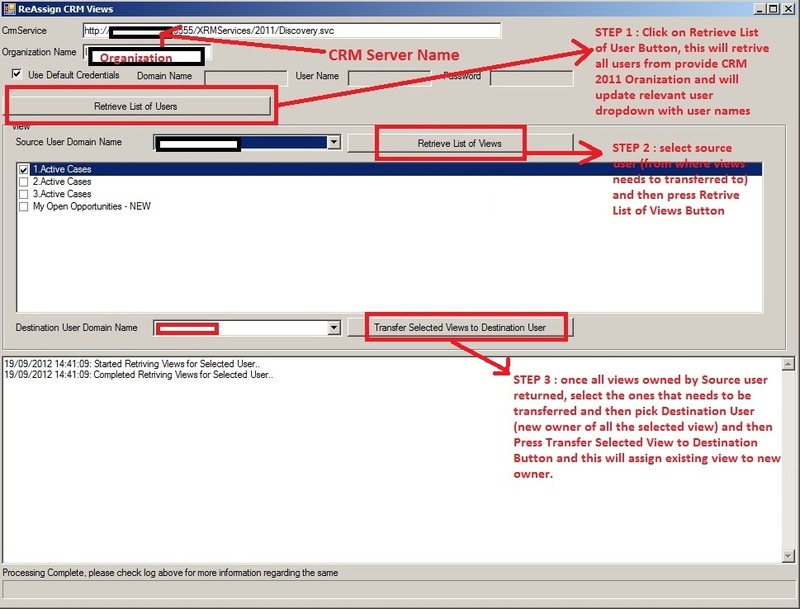 Step 3: provide CRM server name, relevant port number, organization name and provide relevant credential for the same and then click on “Retrieve List of User” button. For further steps and information please refer to following screen print for the same. Note: – Please note that both users needs to active in CRM to perform above actions. This entry was posted in Code, CRM 2011 and tagged CRM 2011, CRM Security, Impersonation, personal view, Tricks on September 21, 2012 by mayankp. Recently we noticed few charts in CRM 2011 displays drill down while other does not display drill down for the same. So your chart will display drill down if axis displays a field which got value searchable set to Yes. This entry was posted in CRM 2011, Tips & Tricks and tagged CRM 2011, CRM Charts, Tricks on May 22, 2012 by mayankp. Few of our users did not like this started pane in CRM 2011 and asking us if we disable this. System admin can switch this setting off for all users by doing following steps. This entry was posted in CRM 2011, Tips & Tricks and tagged CRM 2011, Tricks on September 2, 2011 by mayankp. One of my colleagues had following issue while installing latest CRM roll up for outlook client. Please read this article for the solution regarding this. This entry was posted in CRM 4.0, Tips & Tricks and tagged CRM Plugin, Tricks on August 2, 2011 by mayankp. Suddenly few of our CRM user started seeing full path in CRM IE Title bar. Step 7: Restart all IE Sessions and this issue will be fixed. 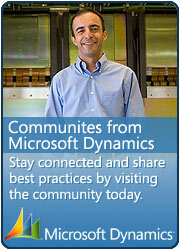 This entry was posted in CRM 4.0, Tips & Tricks and tagged CRM 4.0, Tricks on March 10, 2011 by mayankp. While using CRM 4.0 many times we have to do unsupported changes directly to the database and there is risk involved in running the queries directly to change CRM database record or field. I have small tip for this using SQL Transaction for this. Before running your Query run begin transaction Command then run your query and check the results. If results are ok and as expected then run commit transaction Command. Otherwise if result is not as expected then run rollback transaction Command and that will undo the changes. see below image for explnation on this.. This entry was posted in CRM 4.0, SQL, Tips & Tricks and tagged SQL, Tricks on November 2, 2010 by mayankp.